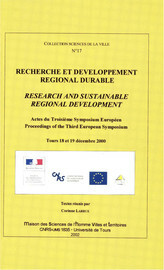 1This third syposium “Regions – Cornerstones for Sustainable Development” was held in Tours in December 2000 under the French Presidency of the European Union. It was organised jointly by the European Commission, the French Ministry for Regional Development and the Environment, the University of Tours, and in particular the Maison des Sciences de l’Homme Villes et Territoires and the Centre de Recherche Ville Société Territoire. It followed the symposiums of Graz (1998) and Joensuu (1999), organised under the EU Austrian and Finnish Presidencies respectively. 2The objectives of the Tours Symposium were to look in greater detail at the results obtained during the previous symposiums, continuing the dialogue between actors in regional development and researchers around the issue of regional sustainable development. 3Each session was therefore organised on the basis of juxtaposing research carried out within a national or European framework, pilot schemes implemented in the field and requests from practitioners. A presentation of specifie topics, such as natural hazards (session 2) and coastal zones (session 4). 5The final discussion looked at the question of research and the need for a multi-disciplinary approach to issues of sustainable development and the relevance of research findings to final needs. 6The records are presented bilingually in French and English. The introduction, final discussion and conclusion are written in French with a complete translation in English. The papers are presented in the author’s language, with a summary of the main points in the other language. 7The preparation of this symposium and publication of these records would not have been possible without the assistance of Nicole RIGAULT and Sylvie SENTISE, (Maison des Sciences de l’Homme Villes et Territoires), and Elizabeth YATES (Inter-Connect) for the English translation. We would like to thank them for their cooperation. Foreword In : Recherche et développement régional durable : Actes du Troisième symposium européen. Proceedings of the Third European Symposium [en ligne]. Tours : Presses universitaires François-Rabelais, 2002 (généré le 20 avril 2019). Disponible sur Internet : <http://books.openedition.org/pufr/1279>. ISBN : 9782869063495. DOI : 10.4000/books.pufr.1279. Larrue, Corinne, (dir..) “Foreword”. Tours : Presses universitaires François-Rabelais, 2002. (pp. 13-14) Web. <http://books.openedition.org/pufr/1279>.